Breitling Crosswind Special Limited Edition "Full Set"
The Breitling Crosswind is one of the Swiss luxury watch manufacturer's most coveted and affordable models. It features bezel rider tabs and Roman numerals. Gold and diamonds also embellish numerous models. For years, the Breitling Crosswind has been one of the Swiss manufacturer's most sought-after models. The Grenchen-based manufacturer stopped producing the stopwatch in the mid-2000s, which is why you can find many pre-owned pieces at affordable prices. The Crosswind was a part of the Windrider collection. The Crosswind Racing and Crosswind Special also belong to the Crosswind family. Top Breitling Crosswind models have chronometer-certified calibers, gold cases, and diamond-studded bezels. However, even the standard stainless steel editions come with excellent detailed finishes. Each hand and Roman numeral has been processed meticulously and coated with luminous material, including the hands on the subdials at 6, 9, and 12 o'clock. 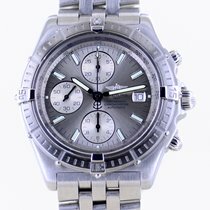 That, together with affordable prices, has led to this chronograph's current popularity. How much does a Breitling Crosswind cost? The Breitling Crosswind can be found almost exclusively as a pre-owned watch. You can buy models in good or very good condition for as little as 2,400 USD. These versions usually have a leather strap. The chronograph costs a few hundred dollars more with a Pilot bracelet. 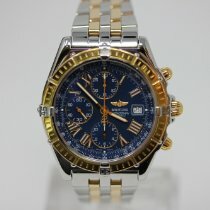 On average, you should have about 3,000 USD on hand to purchase a Breitling Crosswind. If you're lucky, you may find a bicolor model with a stainless steel case and bezel and gold bezel rider tabs for about 3,000 USD. These versions usually cost around 3,600 USD. If you'd prefer a gold bezel instead of gold rider tabs, plan to spend over 4,300 USD. Models in 18-karat yellow gold go for about 9,400 USD. In addition to the Crosswind, the Crosswind Special and Crosswind Racing were also part of the Windrider collection. Breitling only produced the latter for a few years, which is why there are relatively few examples today. Similar to the Crosswind, the Breitling Caliber 13 powers the Crosswind Racing. The satin-brushed case, Chronomat dial, and hour marker indices set this model apart. The subdial hands also lack any luminous material. The Crosswind Racing in stainless steel costs at least 2,400 USD. The Crosswind Special stands out due to its subdial layout and outsize date display. The latter is located beneath 12 o'clock and is especially easy to read. Thanks to the caliber 44, the subdials sit at 3, 6, and 9 o'clock. This movement is based on the automatic ETA caliber 2892 and gets its stopwatch function from a chronograph module. Baton indices mark the hours, similar to the Racing model. The shape of the pushers is different from its sister models: Instead of onion-shaped pushers, Breitling gave the Special rectangular pushers. 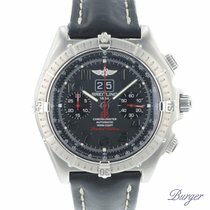 Prices for a Breitling Crosswind Special with the reference number A44355 come in around 3,300 USD. 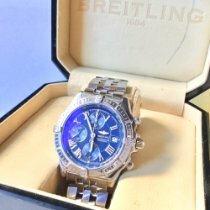 One highlight of this collection is the Breitling Crosswind Special Limited Edition, which had a limited run of 1,000 pieces. You can recognize this model by its Arabic numerals and bi-compax subdial layout. Unlike the standard version, this limited edition only has two subdials. Be sure to set aside almost 5,000 USD for this rare timepiece. The four bezel rider tabs at 3, 6, 9, and 12 o'clock are some of the Crosswind's most distinctive features. These tabs make it easier for you to turn the unidirectional bezel. The use of Roman numerals on the dial is another feature that gives this timepiece a classy touch. Like the hands, the Roman numerals are glow in the dark. This way, you can read the time in the dark just as easily. The small seconds is located at 9 o'clock, the 30-minute counter is at 12 o'clock, and the 12-hour counter is at 6 o'clock. The date display is located at 3 o'clock. The Crosswind's layout resembles those of the Chronomat and Avenger, two of Breitling's most successful collections. The Crosswind's case is about 43 mm in diameter, making this chronograph a rather large timepiece. However, in comparison to the 48-mm Super Avenger, the Crosswind looks almost dainty. At 43 mm, the Crosswind is also suitable for medium-sized wrists. Breitling produced stainless steel, yellow gold, and stainless steel and gold bicolor models. You can tell which material is used for the case and bezel by the first numeral in the reference number: A stands for stainless steel, B for bicolor, and K for 18-karat yellow gold. Thus, the Breitling Crosswind B13355 is a bicolor stainless steel and gold chronograph. Its crown and push-pieces also have a characteristic onion shape. 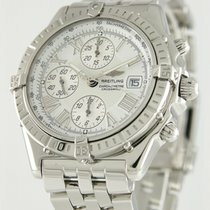 This Breitling men's watch is water resistant to 100 m (10 bar, 328 ft). Usually, the Crosswind is paired with Breitling's Pilot bracelet. The five-link bracelet is fully polished and is widely considered to be one of the most popular bracelets by collectors. Which calibers power the Breitling Crosswind? The Breitling Caliber 13, based on the Valjoux 7750, powers most Crosswind chronographs. However, the special models are powered by the automatic Caliber 44, which is based on the ETA 2892. It has a 42-hour power reserve, outsize date display, and a chronograph function. Breitling has some of their movements certified by the Official Swiss Chronometer Testing Institute (COSC). You can determine if your Breitling watch has one of these types of calibers by looking at the fourth numeral in its reference number. If it's a 3, then it's a chronometer. If it's a 0, the movement isn't certified. For example, Crosswind models with the reference number B13055 are not chronometer-certified. Models with reference number B13355, on the other hand, are chronometer-certified. Like the Caliber 44, the Caliber 13 has a 42-hour power reserve.